Suntory-owned soft drinks brand Ribena is hosting a one-day pop-up colouring cafe in central London, ahead of an experiential event that will be unveiled that same evening. 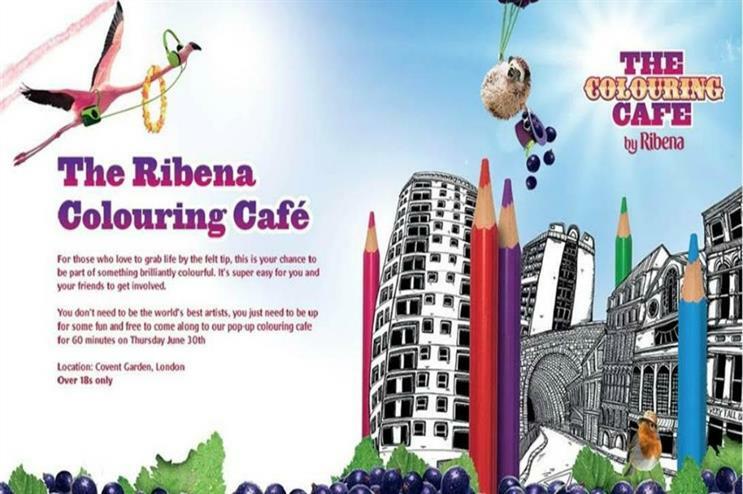 The Colouring Cafe by Ribena will be located in London's Covent Garden, where the brand aims to attract Ribena fans and influencers such as blogger Giovanna Fletcher and the Confetti Crowd, the UK's first blogging 'girl gang', who will be gathering througout the day to create a piece of Ribena artwork. This will be showcased at the evening event. The concept is aimed at those who, says Ribena, 'love to grab life by the felt tip'. Ribena executives will also be in attendance, to highlight Ribena's upcoming brand campaign. The event takes place on 30 June. The Colouring Cafe is the first stage of Ribena's new campaign, which will be followed by social amplification across July.